Yang style tai-chi chuan is the most practiced style of tai-chi in the world today, primarily because it was the first style to be widely taught to the general public. It is also the most variable of the styles with many different manifestations in the way the movements are expressed. The large frame movements that typically characterise Yang style strongly emphasises posture, rooting and yielding. The foundation form is slow, calm, steady and expansive with a focus on turning the waist rather than "tan-tien" rotation. The traditional foundation form, now commonly referred to as the long form, is predominantly performed at a constant speed with only the spins and some of the kicks being fast. 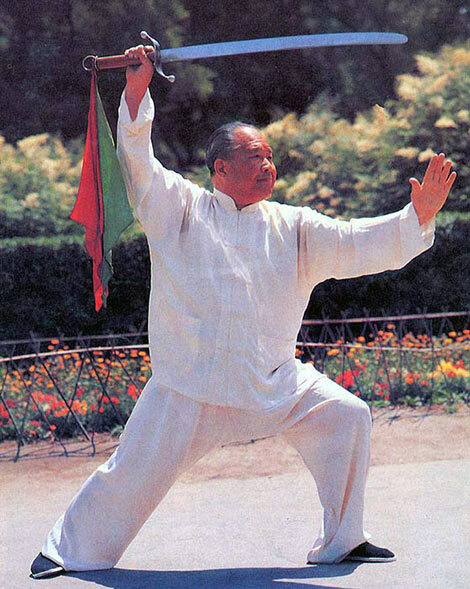 In strong contrast to Chen style from which it was derived, Yang style predominantly uses a bow and arrow stance in the more expansive movements rather than the riding horse stance found in the Chen yi lu. In addition to the 100+ movement foundation form or long form and the short form derivations there is a fast form, family form, sword form and a broadsword form as well as several short two person sets (the ta lu's). Yang style tai-chi has undergone many changes in its lifetime. 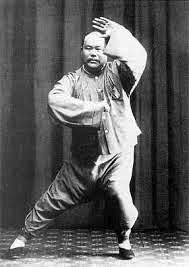 It is recorded that its founder Yang Lu Chan, when he taught at the royal court, himself removed some of the more challenging movements from the form he had learned from Chen Chang Xing. Although most modern Yang style tai-chi derivations maintain an upright posture during the majority of the movements, early pictorial evidence of Yang Cheng-Fu (Yang Lu Chan's grandson) dating back to the 1930's shows that inclining the back was once standard practice. It is rare to encounter this old Yang style tai-chi today but the family tradition is continued through the likes of Master Yang Zhen Duo (top left). Inclining the back has been maintained in the more recent of the two Wu styles of tai-chi which has its origins in Yang Style. More recently many shortened and simplified variations of the foundation form have been developed outside of the family tradition and it is these that are most often taught as Yang style today. These short forms are indicative of the modern trend which recognises the health benefits that tai-chi imparts and seeks to reduce or remove the athleticism that is required of a martial artist in order to make tai-chi more accessable to the general public. The following YouTube video shows a comparison of Grand Master Yang Zhen Duo (1926- ) and Fu Zhongwen (1903–1994) performing the Yang style slow set. Yang Zhen Duo is the 3rd son of Yang Chen Fu and current head of the Yang family. It demonstrates a consistency of style passed down within the family. Two other rare old youtube clips showing the form performed by past masters can be found on the Yang tai chi form page. The Yang in 'Yang style' is a family name and not a reference to the yang of yin-yang.